This lesson covers the physical and mechanical properties of wood. Physical properties refer to density and moisture relations that affect its use. Mechanical properties refer to the strength characteristics of wood. Lesson 1 showed that wood is a porous material made up of cells of various kinds. Depending on the nature of these cells, some woods have more or less solid wood substance for a given sized piece. If you think of a brick of Swiss cheese (with all its holes) and an identical-size brick of cheddar, you can guess that the cheddar brick contains more cheese. So with wood, the fewer holes (cells), the more wood substance. The amount of wood substance for a given volume determines density. Woods with more weight for a given volume have a higher density than woods with less weight. Both weight and volume of wood are affected by the amount of moisture it contains. Therefore, when specifying density it is important to also state moisture conditions. For example, the density of air-dried balsam fir is 430. This means it weighs 430 kg. per m3, at 12 percent moisture content - a standard for strength testing and density measurement. By comparison, the density of red spruce is 450; and sugar maple, is 740, again both in the air-dry condition. As discussed in Lesson 1, density is an excellent indicator of wood strength; the higher the density the stronger the wood. However, a wood with a density of 600 may not be twice as strong as one with a density of 300. It depends on the strength properties being discussed. For example, the amount of deflection of wood in response to a load (modulus of elasticity), as in a joist or rafter, is an important strength property. The actual breaking strength of the piece, rupture (modulus of rupture), is also important. It has been shown how rate of growth affects the mechanical properties of wood. But how does growth rate affect density? There are no hard and fast rules applying to all species, on how growth affects density. Individual species, or groups of species, must be considered to get some idea how rate of growth affects density, and in turn, strength. Growth rate affects the density of softwood differently for different species. In general, density values fall off more severely with very rapid growth, than with very slow growth. The optimum being something in between. The pulp and paper industry found out long ago that maximum yield of pulp was not simply an expression of volume of wood per hectare but had a lot to do with growth rate of the trees. The effect of growth rate on density is easier to predict for hardwoods. Density of diffuse-porous species - maples, birches, and beech -do not vary with growth except perhaps for extremely slow growth. On the other hand, ring-porous species - oak and ash - show highest densities (and strength) for moderately rapid growth. Very slow growth in this group results in marked reduction of density. For hardwoods, strength is usually not a critical property. Hardwoods are used more for their appearance and decorative features. However, for pallets, frame stock, and timbers, strength is a factor. Timber showing the greatest proportion of latewood - with thick-walled cells - has the highest density and in turn strength. Both growth rate and percentage of latewood are used in certain grading rules for some species. When safety factors are especially important such as for scaffolding or bridge work, inspectors visually check the ends of timbers for percentage latewood. Water exists in wood as either free water or bound water. Free water occurs within a cell cavity as a liquid. It is the easiest and first to be removed during drying. This free water moves toward the end surfaces through connecting cells, and laterally through the pits of neighbouring cells. It is evaporated from the wood faces as well as the ends. The point at which all free water is removed from the cell cavity is known as the fibre saturation point (fsp) and is reached at around 30 percent moisture content. 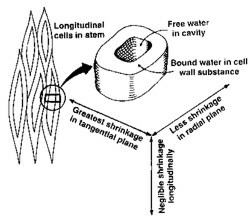 Figure 9 - Anatomy of longitudinal cells, in relation to moisture loss. Bound water is moisture absorbed within the cell wall. This water is molecularly bound to the wood molecules of the cell. It is therefore much more difficult to remove than free water. Figure 9 shows this process. Shrinkage takes place only when bound water is removed. The loss of free water, down to the fsp, has no effect on the strength of wood. However, when bound water begins to be removed, most strength properties increase. The increase in strength is directly related to the amount of moisture removed. Thus, other things being equal, a spruce 2 x 4 (stud) is stronger at 18 percent moisture content than one green from the saw. This refers to a deviation of the line of longitudinal cells, to a straight line parallel to the sides of the piece of lumber. It may be caused by an abnormal growth pattern in the tree, or how the log was sawn. It is usually expressed as a ratio; for example, 1 in 12 (finch of slope in 12-inches length). A slope of grain of 1 in 6 results in a 60 percent reduction in bending strength (strength of a horizontal beam, such as a floor joist, for example). A 1 in 16 slope causes only a 20 percent reduction (see Figure 7). Most lumber grading rules specify the maximum slope of grain permitted in the grade. 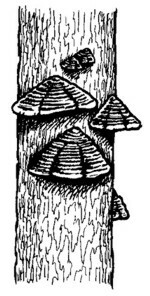 Knots, common in sawn products, are caused by limbs on the tree stem. When a saw cuts through a limb (or its stub) a knot remains. Depending on the angle of both the limb and the saw, a round knot, an oval knot, or a spike knot (longitudinal) will result. For strength purposes knots are classified by size, number, form, and quality. The first two classes are self-evident. Knot form and quality are described as: tight, loose, intergrown, firm and rotten. Most grading rules take these factors into account. These are separations occurring in the wood (see Figure 10). Shakes parallel to the annual rings are called ring shake and those in the heart of the tree and perpendicular to the annual rings are called star shake. In living trees, both forms of shake are caused by wounds, but not all wounds result in shake. Factors that may extend the formation of shake are, internal growth stresses, bending of the tree by wind and the freezing of free water within the cells. Checks are generally produced in the rays of sawn-wood products during drying. 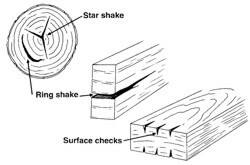 Depending on their severity, checks and shakes have a very great affect in reducing the strength of wood. Figure 11 - Tree stem showing fungi conks, indicating very advanced decay. Decay, or rot; is not permitted in wood used for structural purposes. Recognizing decay in wood is very important. Most decay in wood is caused by fungi. Some of these mushroom like organisms (see Figure 11) attack the wood, eventually destroying its cellular structure. Fungi may originate in the growing tree or the wood may become infected after it is in use. Most fungi originating in the growing tree do not continue to degrade the wood during use. The most serious and common type of wood decay in softwoods in Canada is known as brown rot, or brown cubical rot. It is caused by two fungi and proceeds very quickly under favourable conditions for rot. These fungi cause most of the extensive losses from decay in wooden buildings in North America. In hardwoods, the white rots are most common. Stains and molds in wood are not as serious as decay and are usually accepted in structural timber in local markets. Stain may be caused by fungi and is often an indication of worse things to come. Usually, molds and stain fungi merely give an unpleasant colour to the wood. One common example is the sap staining fungi causing blue-stain in green wood. Bacteria, another type of organism that attacks wood, and was once thought to result in little damage is now known to produce enzymes, which cause shakes in red oak. During kiln drying of red oak affected by these bacteria, honeycombing and serious checking may often develop. To develop and cause wood damage, fungi requires food, air, moisture, and warmth. If any one of these conditions is removed, the fungi will die or remain dormant. One of the most common misconceptions and misused terms is `dry-rot'; often used to describe the brown cubical rot mentioned earlier. The dry condition may be due to the time one observes the damage - long after the rot has taken place and perhaps on a dry day. Decay will not proceed unless there is sufficient moisture available. The critical moisture content below which fungi cannot function is 20 percent. Good silviculture practices affect wood properties. In softwoods, good thinning and proper spacing can enhance growth rates, strength, and other properties. Moreover, spacing can be tailored to the targeted product. For pulpwood species, proper spacing can produce high quality fibre and yield which may not be the same as high volume. For trees destined for structural lumber, spacing can be done to produce a growth rate giving optimum strength. For yard lumber (general construction lumber) - where volume is the main goal - other spacing prescriptions apply. In hardwoods, quality is more important than volume. Remember, fairly high growth rates in diffuse-porous woods are desirable. For ring-porous species, extremely high growth rates are not desirable. Nor are extremely slow growth rates. Where strength is a factor six rings per inch is a minimum. For decorative uses, somewhat slower growth rates are preferred to produce a finer texture. Stands can be tended to provide the required qualities. For example, a sudden and severe opening up of the stand may cause the formation of branches in many trees. These become knots, in lumber or veneer. Selection harvesting and shelterwoods can be designed to remove old, decay-ridden trees. This practice will decrease the chances of infection occurring in the younger trees in the stand. More will be said on silviculture and harvesting methods in the next lesson. Newsprint - mechanical and groundwood pulps. Most softwood species are acceptable, but those with considerable latewood are not favoured (eg. larch, pine). Length of longitudinal cells; ie. fibres, is important. Spruces, particularly black spruce, produce the highest quality newsprint largely due to cell length. Thermo-mechanical pulp (TMP), now mainly used in newsprint installations, requires the same properties. Chemical Pulps - Sulphite and Kraft. Sulphite pulp is usually mixed with groundwood pulp for newsprint. Kraft pulp is used in many applications, particularly for linerboard. Almost any species and quality of wood may be used for kraft. For sulphite, woods with very heavy latewood are not usable. Both produce strong pulps, and strength is related to longitudinal cell length. Black spruce best demonstrates these qualities. Softwood - Softwoods are used primarily for structural and construction lumber, but also find their way into products such as trusses and laminated timbers. These must contain pieces that have properties favouring high strength, such as: moderate growth rate; high proportion of summerwood; straight grain, no compression wood; low moisture content; no decay. For less demanding uses, including construction lumber, most of these properties are not as important. Hardwood - Since hardwood is used extensively in decorative applications such as mouldings, furniture and cabinets, its appearance is most important. Properties that enhance appearance and performance include: moderate growth rate; well-defined annual rings, rays and pores to produce a pleasing `grain'; absence of shakes or checks in finished product; all heartwood or all sapwood to feature colour integrity; very exact moisture content with little or no variation within or between pieces so that shrinkage does not take place in use. Pieces should be strong, straight-grained, with a moderate growth rate, no tension wood, no knots, shakes, checks, or decay, high proportion of late wood. There is a range of panel products. One type is made from veneer logs, other types from low-density woods, and others from mill residue. Plywood is made from veneer, oriented strand board (OSB) from aligned wafers, particle board from small particles, and fibreboard from fibres and fibre bundles. OSB wafers are sliced from small roundwood, usually poplar. Particleboard and fibreboard are produced from a mixture of chipped roundwood (softwood and poplar) and softwood sawmill residues (sawdust and planer shavings). Softwood plywood and OSB can be used for structural purposes. Hardwood plywood is used in furniture and cabinet making. Particleboard and fibreboard are also often used in finished products such as furniture. There are many other wood products. Some of them have specialized properties. Recently developed products include laminated veneer lumber (LVL), finger jointed lumber and edged glued panels. These are generally made from lower grade material (with corresponding lower level properties) to make a highly usable, high strength product. Regard the values as relative to each other to get a good impression of strength. Rupture is a measure of the ultimate strength of wood at the breaking point. Elasticity is deflection in response to load. Even though a piece of wood will not break under a load (weight) it may deflect to such an extent that it cannot be used. This applies to such applications as floor joists, rafters, etc. Mullins, E.J. and T.S. McKnight, 1981. Canadian Woods - Their Properties and Uses Third Edition, Supply and Services Canada, Ottawa.